Great teachers don’t expect gratitude as a reward for their efforts—the reward comes merely from seeing growth and change in their students. But the unexpected happened for Christopher Berg on September 27th, 2003, when more than 30 of his former guitar students gathered in the Recital Hall at the School of Music to present a concert to honor the man who has run the guitar program at USC for 25 years. The concert, which had been in the planning for two years, was a complete surprise to Berg. Former students-many of whom are now guitar teachers themselves-had traveled to Columbia, SC, from Alabama, Georgia, Maryland, Missouri, New Mexico, New York, and throughout the Carolinas and had rehearsed in secret. Together, they represented not only 25 years of teaching, but also, through their contributions to the field of music, a legacy that is a true testament to the influence of a teacher who loves the guitar and cares deeply about his students. The concert began with a performance of Mozart's Symphony No. 44 in D transcribed for guitar orchestra by David Stevenson (BM 84), the organizer of the event and professor of guitar at Clemson University . The orchestra consisted of students ranging from those who studied with Berg when he came to USC in 1978 to current undergraduates. 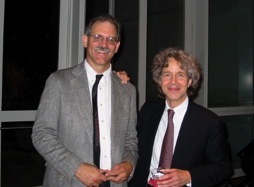 Other works on the program included two of Berg's original solo compositions from his CD The Pilgrim Forest, performed by Rod Lewis (MM 90, DMA 98), who teaches guitar and music theory at Columbia International University and Marina Alexandra (MM 2001), professor of guitar at Wingate College; Landfall II: Flaming Skull for MIDI guitar, composed and performed by McGregor Boyle (BM 81), Chair of the Composition Department of Peabody Conservatory in Baltimore; and Anton Diabelli’s Grande Sonata Brillante, Op. 102 for guitar and piano, performed by James Buckland (DMA 97), professor of guitar at Limestone College and Converse College, and Karen Wisser. “I was floored by their gratitude and generosity of spirit,” Berg said. “It seems I am now learning from them. It was an amazing event, and I was thoroughly humbled.” The concert was preceded by an announcement that the former students had established the Christopher Berg Guitar Endowment Fund, which was set up to provide additional scholarship support to future guitar students at USC. The proceeds from sales of CDs of the concert and of the Mozart transcription will be added to the endowment fund. Currently, Berg teaches about 20 students, oversees the guitar ensemble program, and teaches guitar pedagogy and guitar literature classes. He has also published two books, Mastering Guitar Technique and Giuliani Revisted, which have garnered attention from his colleagues throughout the U.S. All of this is in addition to giving solo concerts throughout the country, and his former students feel fortunate to have had a teacher who is so good not only at teaching but also at performing. It’s no wonder that they have created an endowment fund-they want to be sure that no deserving student will miss out on the great opportunity that they had. For more information about the Christopher Berg Guitar Endowment Fund or to make a contribution, contact Leslie Wrenn, Director of Development of the School of Music at USC, at 803-576-5897.